Karen Burton is leading England in her sixth consecutive U16 FIBA Europe European Championships but only her first in Division A.
England are in Group C with traditional A nations at U16 level: Croatia, Czech Republic and France. England opened the championship with a game against Croatia and unfortunately pre-match nerves handicapped the team as they struggled for the first 20 minutes in all areas of the game. Croatia pressed England into 20 first-half turnovers and allowed them only one success from open play during the second quarter. Croatia built an (8-3) early lead into a commanding advantage (22-11) after a 10-0 run. The contest was more or less over by the interval with Croatia leading (39-16). The Croatian coach Dean Nemec tried out different things during the second half of the match but failed in extending the lead as England pulled themselves together. Unfortunately Maja Marosevic was hurt badly and her tournament might be already over. 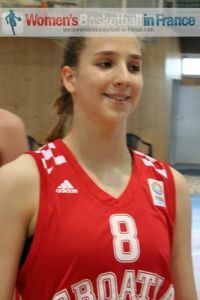 Iivana Dojkic (in picture) was the games leading scorer with 22 points while Patricia Bura dominated the rebounds with 13. For England Leah McDerment was the leading scorer with 10 points. McDerment who is playing in her fourth FIBA Europe U16 championship explained that the difficulty for her team was the speed of the opposing guards, something she had not experienced before. You can watch here the after-match comments from McDerment. When looking at the final scoreline beating Czech Republic (68-39) one may think that France had it easy. However this was not the case. 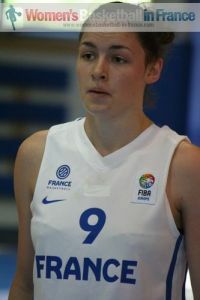 Louise Dambach (in picture) from France were in electrifying form and France appeared to be comfortable and the pick-and-roll system worked well. However the Czech Republic's coaching staff of Richard Fousek and his assistant Richard Klein changed tactics and went small. Eva Moucková's quick pace troubled France and the Czech Republic outscored France 8-2 to finish the first quarter trailing (12-17). The second quarter was typical of U16 high level FIBA youth international basketball with a lot of effort and little reward with both teams missing the unmissable but hitting the difficult shots. Both coaches became speechless and it required a time-out by Arnaud Guppillotte, the French coach to kick-start things. He questioned his players about what they were doing and then he asked them to respect the scouting and to start playing with their heads. France then slowly pulled away (27-16) and opened up a double-digit lead (27-16) with 16 minutes played. Both teams struggled in attack during the last four minutes but France were still able to extend their advantage (30-16) at the interval. The third quarter was delightful as it turned into a battle of the guards with Duchet and Marylie Limousin from France taking on Gabriela Andelová and Moucková. Neither side won as they tied the quarter (17-17) allowing France to maintain their advantage (47-33). France turned on the turbo in the final quarter with Dombach leading the charge and excellent hustle scores by Carla Blatrie to cruise to victory (68-39). In the FIBA Europe after-match comments Camille Cirque speaks about the honour of representing France while Maimouna Ba adds information about the match and the history of the fish mascot.